Sign up below and we'll send you a free 2018 catalog. Jamestown Distributors was established in 1977 as a supplier of stainless steel fasteners to Rhode Island boatbuilders. 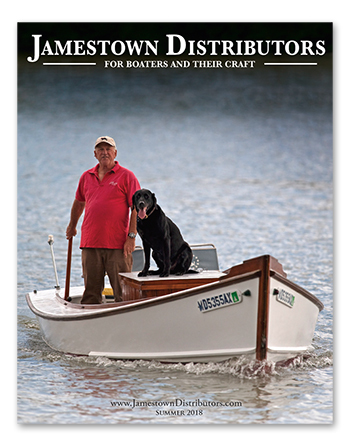 Today Jamestown Distributors is a company selling boatbuilding and woodworking supplies worldwide. Jamestown Distributors inventories and sells over 60,000 fasteners, tools, abrasives, adhesives and building supplies for woodworking, boatbuilding and construction. 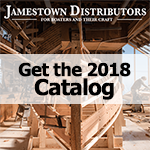 The Jamestown Distributor Catalog has 68 pages of products, Customer Stories, tips, techniques and important information that will help you build anything! Yes! I would like to receive any news, tips and ideas for woodworkers and boatbuilders. Please sign me up on the Jamestown Distributors email list. I can always unsubscribe if I change my mind.